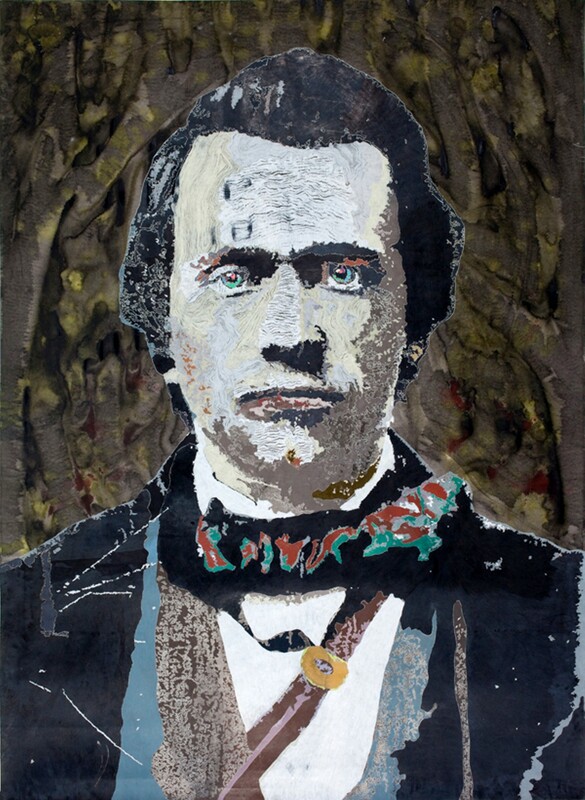 Nineteenth-century Oregonians become the undead in Fidler's exhibition at Johansson Projects. 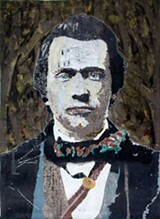 Detail of Anna Fidler's "Henry Pittock." Between Twilight and True Blood, Hollywood has catapulted the vampire higher into the stratosphere of spectacle culture than ever before. With this cultural phenomenon in mind, one may begin to bridge the apparent chasm between Portland artist Anna Fidler's current subject, 19th-century Oregonians with an undead gleam in their eyes, and her previous one, players for NBA basketball team the Portland Trail Blazers, whom she depicted in more or less the exact same way. Fidler's artistic process, which involves staining a canvas with dark, watered-down acrylic and then building an image from an agglomeration of colored pencil splotches, has always left her subjects looking somewhat zombie-esque. From afar, her large-scale portraits resemble pixelated negative images. Up close, an incredibly detailed line work — Fidler's way of simulating the effect of layered paper — suggests erosion or decay, lending the subjects a diseased quality. She also tends to reserve the brightest palette for the eyes, giving them an eerily unnatural luminance. At the same time, rays of acrylic emanating from behind subjects' heads would seem to suggest saintliness. Applied to an NBA basketball team, this treatment amounts to a critique of typical spectacle sport iconography. Apply it to the grave visages of Victorian frontiersmen, though, and you've got yourself a roomful of psychedelic spooks. With the exception of one prominent lumber baron, Fidler's subjects are in no way famous or even known. The artist's mission here is not to warp existing auras, as with the Trail Blazers players, but to confer them — to swathe ordinary people in a sinister suggestiveness or larger-than-life narrative. Like Hollywood, she soon found herself in the company of vampires and werewolves. "I would go to the Oregon Historical Society and look at their photographs, and look for people who look mysterious — who have a certain gaze," Fidler said. "The direction of the gaze, whether it is outward or off to the side — those small elements are what determine whether or not I will choose a photograph as reference." From there, Fidler set to work dyeing and drawing in her studio, which she describes as at once "very dark and dungeon-like" and lively. Her works aim to intimidate, so size is key (the largest of them measure 99 inches by 72 inches), and at their level of detail, this means that teamwork is required. "My practice is very social," Fidler said. "People think it's isolation, working many hours by yourself. Actually, it's a lot of talking, working with other people." With the vampire cresting in pop culture, the creepy congregation at Johansson Projects is not only emotionally transfixing, but delivers Fidler's recurring statements about portrait representation and implied narrative, icon and spectacle, with clarity and verve in all the places where the Trail Blazers series dropped the ball.